1 of 2 Sprinkle pork with salt and pepper. 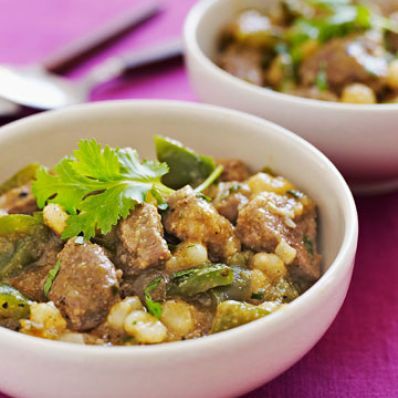 Place pork in slow cooker with peppers, onions, garlic, chili powder, oregano and broth. Cover; cook on HIGH for 4 hours or LOW for 6 1/2 hours. 2 of 2 Stir together salsa, cornmeal and cilantro. Remove cover and stir in salsa mixture and hominy. Cook an additional 15 minutes or until thickened and warmed through. Per Serving: 39 g pro., 749 mg sodium, 4 g fiber, 347 kcal cal., 4 g sat. fat, 114 mg chol., 0 null Mark as Free Exchange, 11 g Fat, total, 23 g carb.